My favourite dish to make is tandoori prawns from a recipe by chef Atul Kochhar. I also love to eat at an Indian restaurant. My go-to place is the Gaylord in London. It has been around for 50 years and is still run by the same family. They came on my Soho Radio show with some tasty treats. Ciao! Cut any excess fat from the chicken and discard it. Put the chicken pieces in a medium-sized casserole dish or bowl. With a mortar and pestle grind the garlic, ginger and coriander and cardamom seeds to make a paste. Transfer the paste to a food processor, add all the remaining marinade ingredients, except the chillies, and whizz until smooth. Stir in the sliced chillies then pour the marinade over the chicken. Cover the dish, or put everything into a zip-sealing bag, and chill for 2-8 hours. Drain the marinade from the chicken and set aside. Bake the chicken pieces for 25 minutes. Remove from the oven and rest for 10 minutes. To serve, reduce the leftover marinade over a high heat and drizzle it on the chicken with the coriander leaves and chillies. Preheat the oven to 180°C/350°F/Gas Mark 4. Combine the flour, cloves and half the brown sugar in a bowl. Place a piece of parchment paper on a flat surface. Sift the flour mixture on to the parchment and back into the bowl. Repeat. In a stand mixer with a whisk on medium beat the egg whites until foamy. Sprinkle in the cream of tartar and beat until the whites triple in volume. Add the rest of the sugar, 1 tablespoon at a time, and beat until it is incorporated and the whites are thick and glossy. Turn the speed to medium-low and fold in the flour and sugar in three additions. Add the orange zest. Spoon the batter into a 25cm unbuttered loose-bottomed cake tin. Run a knife through to break up any air bubbles. Bake for 45 minutes until the cake is golden and springy to the touch. Invert the tin on a cooling rack to cool. Meanwhile, rinse and drain the berries, leaving a quarter of each on one side. Put the remainder into a large pan, add the caster sugar and spices and over a low heat bring to a simmer, stirring to break down the berries. Strain out the seeds then stir in the lemon juice. Cover and chill. Remove the cake from the tin and slice vertically into 2cm slices. Lightly moisten a spring-form pan and line with cling film, leaving enough to fall over the edges. Sprinkle in a third of the reserved berries then add a ladleful of coulis. Press in a layer of cake, filling in the cracks to give a patchwork effect. Repeat 2 or 3 times and top with a little sauce. Fold over the cling film and put another layer on top. Put a plate with a 500g weight or can on it on the cake and chill in the fridge for at least 3 hours or overnight. For the sabayon, put the cream, lemon verbena leaves and vanilla pod into a pan and bring to a simmer, stirring. Cool, cover and infuse for at least 2 hours. Put the yolks in a bowl over barely simmering water and whisk well. Slowly add the caster sugar, then gradually add the wine and whisk vigorously for 10 minutes until light yellow and fluffy. Transfer to an ice bath and whisk until the mixture is cool. To serve, strain off the leaves and whip the cream into soft peaks. Fold the cream into the egg mixture in three stages, mixing to combine. To make the peach coulis preheat the oven to 180°C/350°F/Gas Mark 4. Put the peach quarters in a large bowl, sprinkle in the brown sugar, ginger and allspice and toss to coat. Oil a baking tray and arrange the peaches on it, cut side up. Sprinkle with salt and white pepper. Bake on the middle rack for 30 minutes until bubbly and caramelised. Purée when cool. Cover and chill. Peel the cling film from the cake and cover with a plate. Flip it over and remove the pan. Peel off the film. 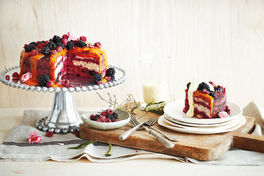 Slice the cake into wedges and spread a little peach coulis on each, then spoon the sabayon over the edge of the cake. Garnish with berries and edible flowers.